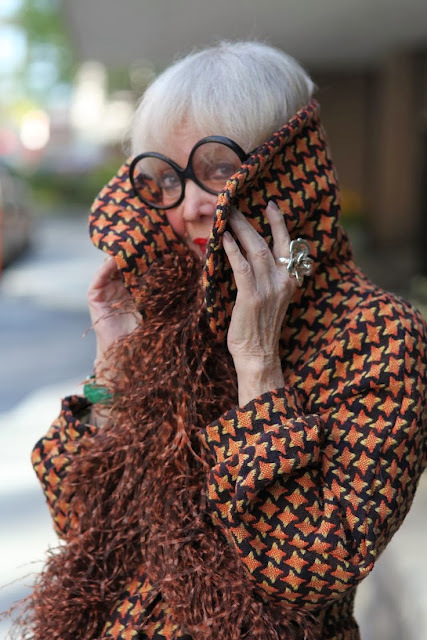 I love Street Fashion blogs like The Sartoralist, Advanced Style, Stockholm Street Style, the New Zealand bloggers Street and City Photos and Four Eyes and of course Bill Cunningham for the New York Times. They offer a range of everyday fashion from ordinary people which is often a cheaper and more original way of dressing based on comfort, practicality and aesthetic. You can see geographical and seasonal trends. I love how New Yorkers cleverly cope with the heavy winter snows. Today I found a fabulous collection of large format fashion books in our local library so will be eagerly making my way through those. This one being a favourite- Rare Bird of Paradise: The Irreverent Iris Apfel. I adore this woman. She has so much outrageous courage and guts with her personal aesthetic. Plus she is 92! 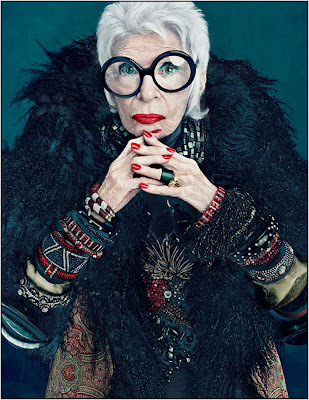 Extreme role model of style.